If you are like me and have a collection of audio CDs, you will want to be able to play them without having to have a portable CD player or spending time going through your CD library. aTunes allows you to import your CD collection to its music repository. Obviously, to import a CD, you must have a CD/DVD drive available. Most PCs (and Intel-based Macs) built in the past five years do not include a CD/DVD drive as part of the system. Fortunately, you can purchase external CD/DVD drives that plug into a USB (2.x or later) port. As these are USB mass storage devices, you should have no trouble getting one of these to work with PCLinuxOS. When you insert a CD into the CD/DVD drive, PCLinuxOS will mount the CD and give you a list of options on what to do with the CD. In this case, PCLinuxOS has correctly identified the CD as an audio CD. 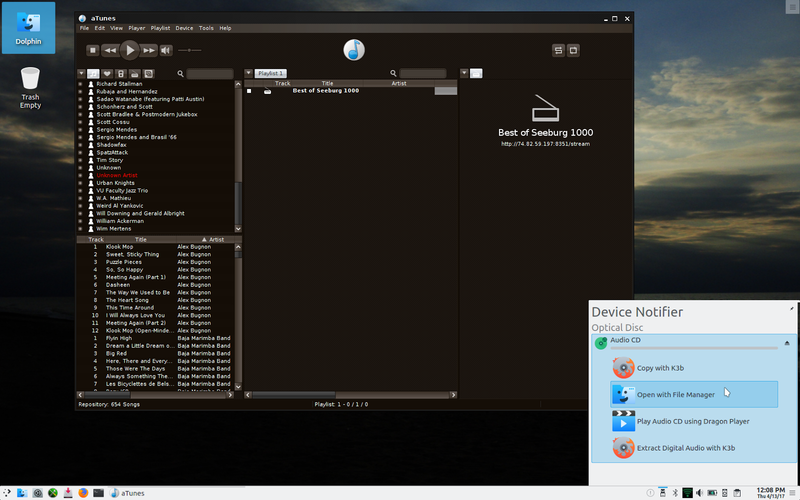 Under KDE Plasma 5, you get the Device Notifier asking what to do with the audio CD. We can safely ignore this as we are using aTunes to import the CD. 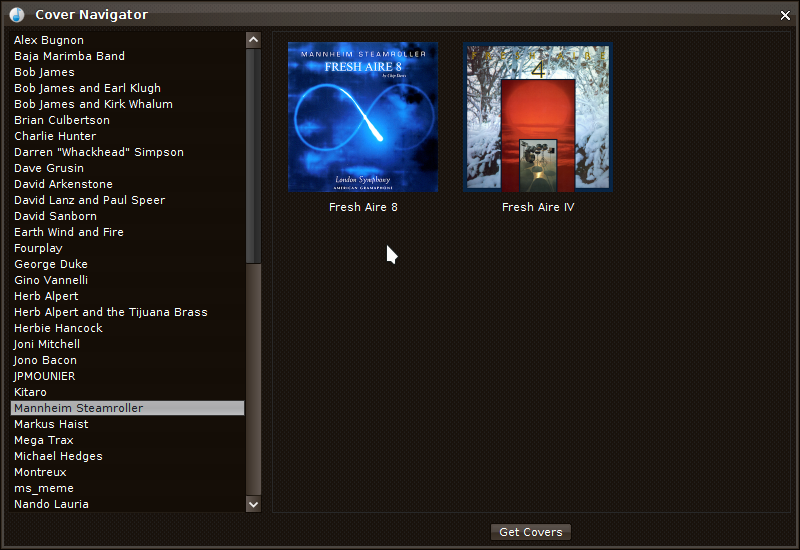 To import a CD into aTunes, select Import CD from the Tools menu. For this example, I used Mannheim Steamrollerâ€™s Fresh Aire IV. aTunes utilized Last.FM to get the information about the CD just inserted into the CD/DVD drive, so all of this became available without any intervention on our part. For those of you not familiar with Mannheim Steamroller, this is the musical group best known for their holiday music releases back in the 1980s. American Grammaphone is the Omaha-based record label where Mannheim Steamroller (and its members) recorded their albums. Both entities were founded by Chip Davis, who first got his fame from his collaboration with Bill Fries (aka C.W. McCall) on the composition of the song Convoy back in 1975. The Fresh Aire series was produced from 1975 to 2000, and was a series of compositions that combined the styles of baroque, jazz and rock. The first four albums in the series represented the four seasons of the year. This example represents winter. The fifth album in the series represents the moon, the sixth album focuses on Greek mythology, the seventh album represents the number 7, the eighth album represents infinity, and there is an album of interludes which is a compilation of piano interludes from the first four albums performed by Jackson Berkey. Wikipedia has an extensive article on Mannheim Steamroller. By default, aTunes encodes each track on the CD in Ogg Vorbis format. You may wish to change this to MP3 if you want to export the tracks to a media player that does not support Ogg Vorbis. The Use Error Correction when ripping option is useful of your CD contains scratches and other physical flaws on the disk that prevent the CD from playing properly. You may change other fields about the CD if necessary. 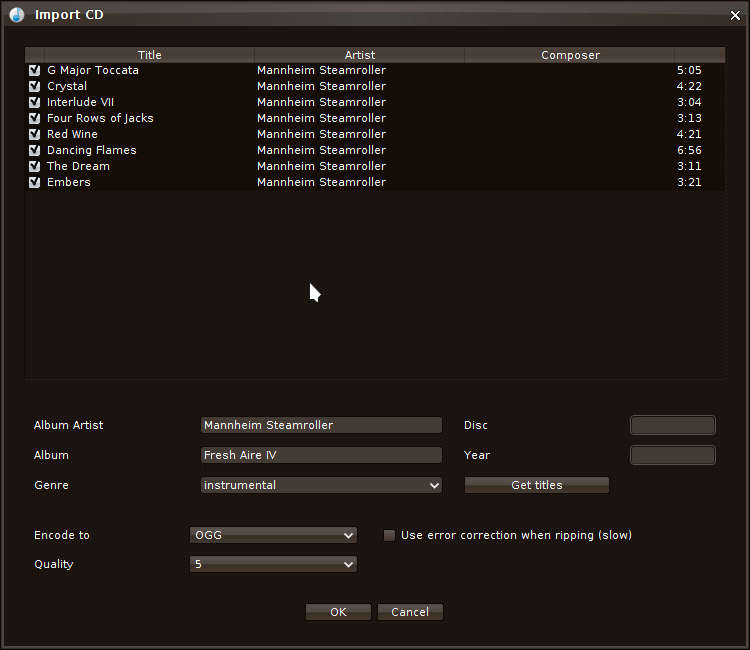 Click on OK to import tracks from the CD. Here, we can view the progress of the import. Decoding here refers to the CD being read. A normal CD contains standard WAV format tracks. Some CDs have individual tracks that are encoded in MP3 (those labelled as MP3-CDs), and hence the tracks are decoded as they are being read. Encoding here refers to the encoding of the current track to Ogg Vorbis (unless you changed the format to encode in the previous dialog box). Muzak Corporation (now Mood Media) had a music player system called the Emcompass XD CD Music System. From the outside it looked like a CD duplicator, with a few controls. Essentially, it was a media player embedded onto a circuit board with a IDE controller for the CD-ROM drive. The controls on the front of the unit are used to navigate the CD. CDs produced for the Emcompass system were nothing more than a single directory containing MPA files where each file contains track information that is displayed on the two line LCD screen. MPA is not the same as MP3, though they are both audio file formats. MP3 refers to a third layer compression of digital audio, which is not present in the MPA format. 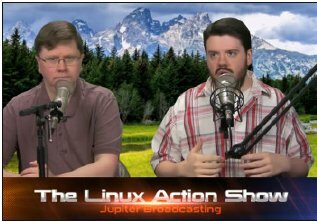 MPA files are audio-only MPEG files, with the audio taking up both the video and audio layers of a MPEG file. aTunes can import this type of CD as it supports MP2 files, not just MP3 and standard WAV. When aTunes is finished importing the CD, it appears in the track listing. In this example, Fresh Aire IV appears below Fresh Aire 8 and the tracks are listed on the bottom side of the panel. 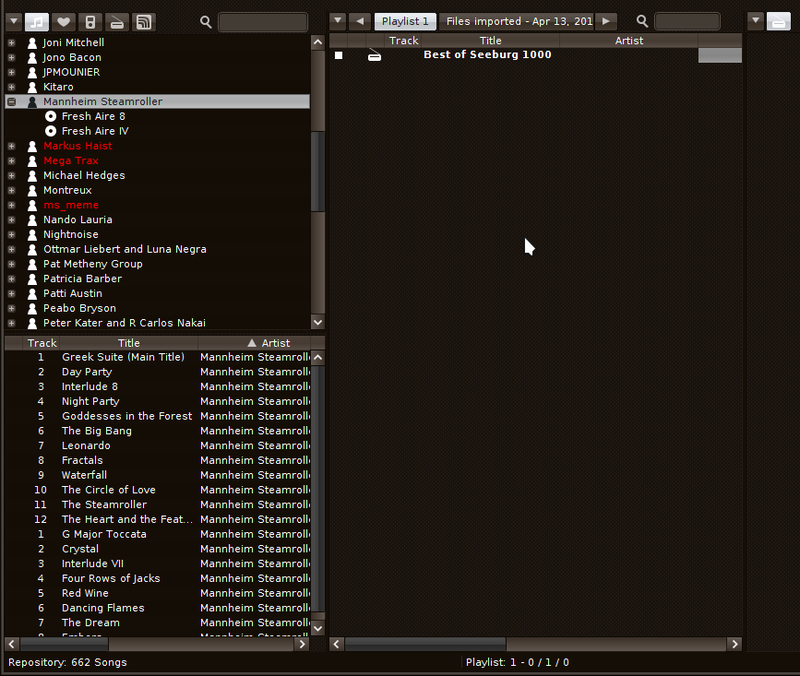 aTunes utilizes LastFM to retrieve album covers that are displayed when the album (or any one of its tracks) is playing. Selecting Cover Navigator from the Tools menu will bring up the utility to retrieve and view the database of album covers used by aTunes. Click on Get Covers to download album covers for the collection of albums by each artist listed on the left side of Cover Navigator. Here, the album covers are correct for the albums that are in the repository. Not all albums have downloadable covers. Where there is no album cover available, there is no image to see and hence that cover remains blank. Once you are done with the Cover Navigator, your CD collection should be accessible and playable through aTunes.